[By Nick, new limited edition for Jan-June] Time to extend my Turkey Hill sampling lead against Dubba with a double take of a couple new limited batch flavors. Both are from lines I've never tried before. Sure I've had no sugar added and greek froyo before, just not from Turkey Hill so this should be interesting. 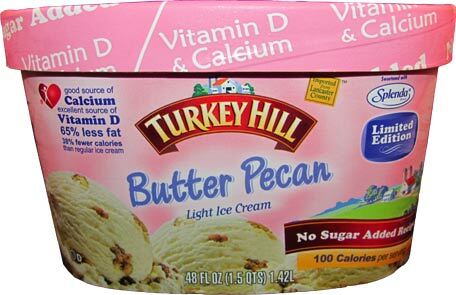 Since the Butter Pecan is technically no longer the current limited edition light/NSA flavor (it was the limited edition for January through June though I just finally found it), let's look at that one first. Things look good from the start. 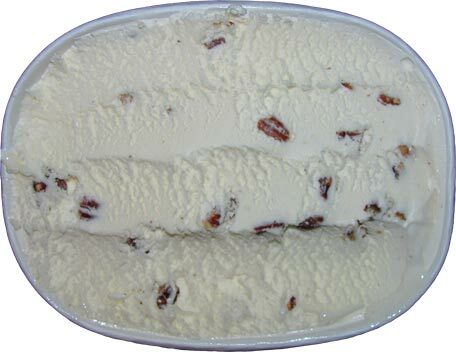 I love when a company has tons of pecans in their butter pecan and that's exactly what we have here. The texture and consistency isn't all that different from regular ice cream either. I'd be hard pressed to tell this has no sugar added by texture alone which isn't something all that easy to do. However, I'm able to tell it in the flavor. This is the sweetest butter pecan I've had. I'm guessing that has to do with all the artificial sweeteners Turkey Hill has to use. While I'm not getting any funky aftertaste or overly sweetness, I can just tell that this isn’t your typical butter pecan. It's not a bad thing by any means though and I'd imagine those who would be the target market for this product wouldn't notice it as much as me either. ‎The pecans also act as a buffer for the extra sweetness with their salty, butter like flavors. It's good to know that if I ever have to reduce my sugar intake, a decent nsa butter pecan is possible. Anon, that's the time frame that it'll be produced but like most limited editions, there are some that last on shelves much longer than their production dates. Don't worry, the ice cream is far from expiring if that's what you were thinking aha.